The CSIRO has regions for projecting the impact of Climate Change. See https://www.climatechangeinaustralia.gov.au/en/climate-projections/futur... This state, Fitzroy Crossing (K), is one of the clear projections in a CSIRO cluster called "Monsoon North region". CSIRO's Monsoon North region coincides exactly with BloggerMe's K,J,H,G,F,E,D,C,AF. The CSIRO has regions for projecting the impact of Climate Change. See https://www.climatechangeinaustralia.gov.au/en/climate-projections/futur... 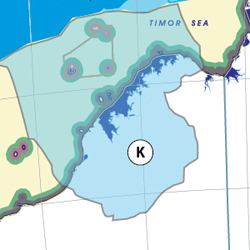 This state Fitzroy Crossing (K) is one of the clear projections in a CSIRO cluster called "Monsoon North region". CSIRO's Monsoon North region coincides exactly with BloggerMe's K,J,H,G,F,E,D,C,AF. The Kimberley's leading Canning Basin exploration company, Buru Energy, has charted a meteoric share price rise and then an equally dramatic fall. Resources journalist Tim Treadgold says the price tracks the initial excitement around shale gas followed by the growing realisation that high costs make it unlikely to be profitable. "One simple test is 'What's their share price done in the last two years?' It's down 90 per cent." 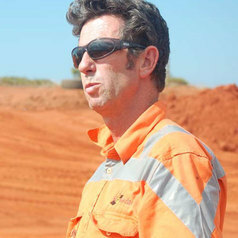 Mr Treadgold said that the crash of energy markets is only part of the problem facing the Australian exploration company. "Two things have happened to Buru: the oil price has certainly given them a whack around the ears, but it has to every other oil company. But secondly, they really haven't discovered that much... The hardnosed investors are now looking at it and saying, 'Show me the gas, show me the market, and show me the business case.' And Buru has been found wanting." An historic agreement to give Broome's traditional owners freehold title to more than 276,000ha of Kimberley cattle country. The deal between the Yawuru and the Indigenous Land Corporation gives the Yawuru exclusive ownership of the sprawling Roebuck Plains Station and the Roebuck Export Depot. Yawuru leader Patrick Dodson: the signing was "a momentous milestone in our journey to rebuild the Yawuru nation". The family of senior lawman of the Goolarabooloo and Custodian of the Northern Tradition, Mr. J. Roe who passed away in Perth yesterday, wish to inform his many friends and colleagues across Australia that they await with great sadness his return to his country. The family will now begin preparations for his funeral here in Broome and would ask that they be allowed the privacy and space to make these preparations. At this time the family would like to thank all those friends and colleagues who have maintained the vigil with them in the period between his becoming ill and his final demise. He is a son, brother, father and husband to his family and a leader, teacher and spiritual guide to many Australians who believe in the importance of Aboriginal law and culture to this nation. His legacy will be great and his passing will leave a gap in the lives of the many that his life has touched. I want to let you know about the first collaboration of the ISX with Pozible. Aubrey Tigan is a legendary man and we need to get the word about his culture and his community. We also need to support Goolarri Media Enterprises in Broome. This organisation, which won WA's community organisation of the year last year, runs a 24 hour television and radio station and much more. Most of all it creates careers in the media for Aboriginal young people. With these things in mind, I hope you will watch the trailer at this link and make a special effort to support this project. The “Botsman report” explores the interconnected roles of the WA government, Woodside Petroleum and the Kimberley Land Council that have resulted in a proposal for a massive gas hub at James Price Point. The report outlines the major meetings and dealings of the parties involved, revealing major flaws in the process. Moreover, the report provides a compelling case for the proposed development at JPP to be permanently shelved and for the ultimate protection of that country. Subsequently, recent conflict of interest and probity issues surrounding the EPA, WA government and Woodside have emerged that further raise serious questions about the integrity of the process. There is no better time than now, with final environmental and investment decisions pending, for better public understanding of the process to date as outlined in this report. Can anyone help me out: I'm looking to get into contact with any Tweeps who live in #Broome. It's for a Community Planning uni project.